No flaming, spamming, or vandalism. Any flaming, spamming, or vandalism will be removed. Do not remove comments unless they are flaming, vandalism, or spamming. Friend requests are allowed, but only if I know you well enough. I will most likely respond to you on this page. 25 Where can I find the prerequisites to be an administrator here? 36 "Glitch Pages are Always Semi-Protected"
Me winning against a Bandit. 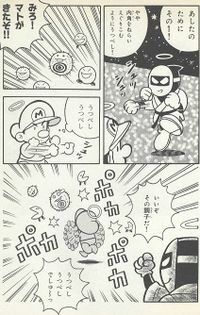 Note that the Bandit's expression is accurately based on Toad's expression here. My image SMB Pinball-Front screen-litup.jpg is flipped but when i uploded it it was flipped. How do I de-flip it? And how do i make it smaller?Thanks! The preceding unsigned comment was added by Doomhiker (talk). Everyone's already said it all, but congratulations! This one. 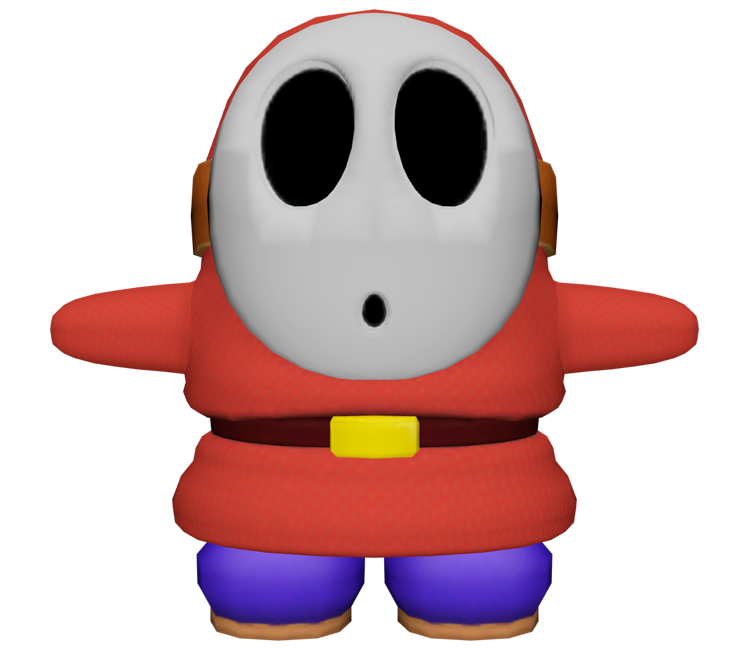 I still based the Bandit (while failing at a Mini Battle)'s expression off of Toad's on the picture i showed you. 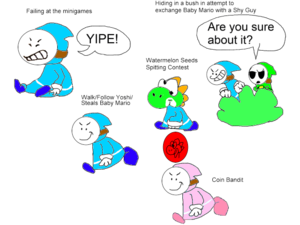 Have you any idea if the bean enemies from Yoshi's New Island are actually called Beanies or not? Sometimes, the boss's name isn't directly refering to the species, such as Snifberg, despite the enemy is called Ice Snifit. This would make Beanie an unsourced name. Have you any source aside from the Big Beanie boss's name? 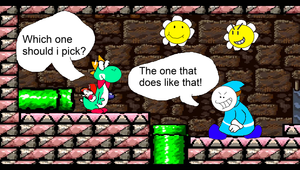 The preceding unsigned comment was added by FanOfYoshi (talk). Here's a Bandit trying to fake hint me. 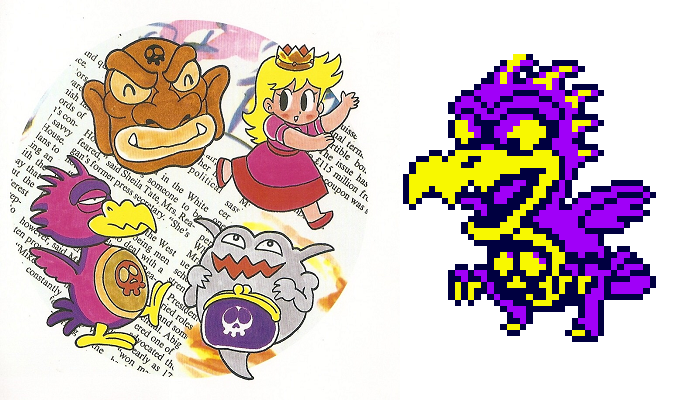 Note that for the Dizzy Dandy, i ripped a Bandit's sprite expression from Paper Mario (found in spriters ressource). An ip adresse username called ‎83.21.105.84 has been vandalizing the WarioWare (series) page with false information, by adding the game wario ware silver and bronze, a game that does not exist, on said page. The info under the wario ware silver and bronze section is just a copy-and paste of the game and wario section, and the reference the the user as given is a link to a website announcing the game game and wario in 2013, not an e3 2019 announcement for wario ware silver and bronze like the user is claiming it to be. Should I remove or wait?~~Doomhiker Edit: never mind, the vandal has been stopped. From User:Boomaster74 I do not like the content of my talk page, can I remove it and replace it with something else? Where can I find the prerequisites to be an administrator here? i am wondering about the fact, that i am not allowed to create my own userpage (german: "Benutzerseite"). What is the reason for that? "Glitch Pages are Always Semi-Protected"
This page was last edited on March 24, 2019, at 08:18.